The European Virtual Observatory initiative began to organise regular “Technology Forums” during the VO-TECH Design Study (2005-2009). VO-TECH was led by the University of Edinburgh (UEDIN). These meetings gathered the European teams involved in the development of the VO framework of standards and tools to disseminate information about technological activities and expertise, to build collaborations, to discuss future activities and to coordinate European participation in bi-yearly International Virtual Observatory Alliance (IVOA) “Interoperability” meetings. The astronomical Virtual Observatory is an international endeavour, and the IVOA leads the development of the interoperability standards, in which European teams have been playing a key role since the beginning. The usefulness of these meetings was immediately obvious, and they were continued by all of the follow-up projects funded by the European Commission in the e-Infrastructure framework during FP7: the Integrated Infrastructure Initiative Euro-VO Astronomical Infrastructure for Data Access (EuroVO-AIDA, 2008-2010), as well as the two small Coordination Actions on which the coordination of European VO activities relied from 2010 to 2015: Euro-VO International Coordination Empowerment (EuroVO-ICE, 2010-2012) and Collaborative and Sustainable Astronomical Data Infrastructure for Europe (CoSADIE, 2012-2015). Coordination of technological activities has been identified as one of the three pillars of the European Virtual Observatory 1, together with the support given to data providers to publish their data in the VO, and to astronomers in their usage of the VO. It was clear, when the Data Access, Discovery and Interoperability Work Package was set up for the ASTERICS proposal, that regular gatherings of the technical teams would be necessary. In addition to continuing the coordination of the technical work on VO development in Europe, Technology Forums were also identified as a key vehicle to put in touch the technical teams working on the VO and those from the ESFRI and pathfinder teams, to share knowledge and build collaborations on technical work. The Forums are thus part of ASTERICS WP4 Task 4.3 “Update of the VO framework from feedback and requirements”, co-led by UEDIN and CNRS/UMR7550-CDS. 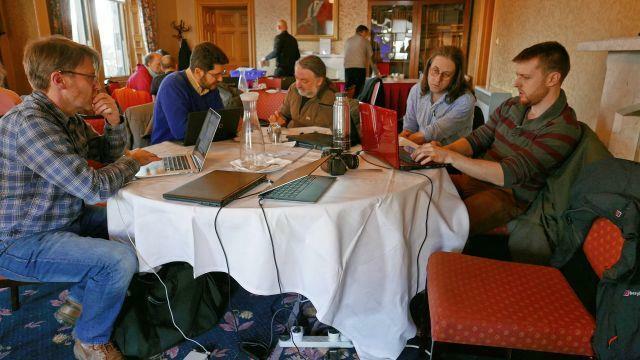 The Second ASTERICS DADI Technology Forum”, organised by UEDIN in Edinburgh on 7-8 March 2016, was the fourth event organised by ASTERICS WP4 following the first Technology Forum, the First DADI School and the First ESFRI Forum & Training event. The meeting programme was organised to disseminate relevant information, in addition to technical discussions. Record of the event is provided on the wiki.